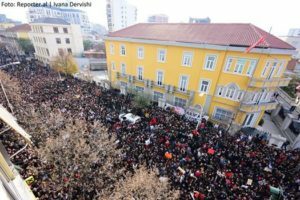 Albanian Students Revolt: What Is to Be Done? In the last days, thousands of students have flooded the narrow street where the Albanian Ministry of Education, Sport and Youth is located. Demonstrations of this magnitude are not alien to the public. In the last three decades there have been plenty of anti-government demonstrations in Albania, and apart from a few notable exceptions, they have been successfully co-opted by various mainstream political parties. Thus, one of the main features of this protest has been a clear collective attempt to keep it unaffiliated with any political party, the main reason for this being the fear of losing the credibility. The Albanian education system, in spite of its traditional resistance to change, was able to generate a wave of discontent that stirred students into action and challenged the tenets of the neoliberal policies that have taken hold of higher education. That universities are treated as business, students as consumers and knowledge as a commodity is a symptom of capitalism in general, and not at all an Albanian specificity. In 2009, Croatia witnessed the second largest student uprising since the Croatian Spring in 1971. Not only did the students occupy the university but they also wrote a manual. “The occupation cookbook” provided a detailed account of the 35-day-long occupation of the University of Zagreb, which was not only an attempt of registering what happened but also to provide some didactic lessons, should the need arise in other times or in other countries to occupy an university. According to this manual, an occupation is not a hostile take-over but an attempt to return the university to whom it belongs; to students and professors in order to reopen to the public a space captured by private interests, wealth and privilege. This demand was not new; during the students’ revolts of May 68 in Paris, this was exactly one of the main claims of the occupation of Sorbonne, to open the university to the less privileged. The Albanian students, however, did not choose to occupy the university but to abandon it and run into the streets. This symbolical abandonment showed the failure to recognize the university, to put it in Althusser’s words, as part of the ideological state apparatuses that requires radical change and that needs to be claimed back as an independent space that functions outside the dominating political narrative. This decision might have also been a practical one: the occupation requires organization and active contribution, not only showing up but also participating in discussions and developing a political position that is not isolated within the status quo of their milieu. By contrast, choosing the street as the physical space of the revolt is convenient because it is easier to join a protest that takes place in the street rather than inside an occupied building. The hope nurtured by many of those in Albania dissatisfied with the status quo and the government is that the students discontent could act as a “detonator” for a general protest. Workers strikes seconded the occupation of Sorbonne in 68 and their struggles intersected, to evoke Althusser once again, in an historical encounter. 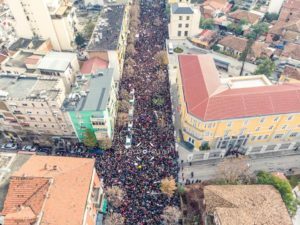 Until now, the students protest in Albania has lacked not only this historical encounter but also the internationalism of the Croatian manifesto, and above all, it has lacked the historical conditions that made the Albanian student movement of December 1991 successful. Sporadically, different public names have joined the protest, some in sign of solidarity, some because of nostalgia, and some as an attempt of winning a political momentum. The protestors demand a greater student presence in the decision-making boards, the cutting of tuition fees in half and a higher budget for education. There is nothing radical in these demands. They are not demanding the impossible as the famous May 68 slogan did (Soyez réalistes, demandez l’impossible) but something doable, and pragmatic. The problem with having doable and pragmatic demands is that once accepted, there is no longer space for a wider and general revolt so much needed in the country where economical disparities are flourishing and the income gap is getting ever deeper. The protesters have identified the Minister of Education as the target of their revolt, ignoring the fact that ours is, for lack of a better term, a representative democracy, and responsibility in such political systems must not be searched only in individual political figures but in the whole administration, and furthermore, in the political and economic system. Revolting against the minister of education and the prime minister is shortsighted. Every political party that will come in power in Albania is doomed to perpetuate the same inequalities as their predecessors unless there is a radical change. In these conditions, if the students see any potential in their protest that could extend in the future, they might need to establish democratic decision-making organs. Organizing a general assembly where all members of the collective are present and have the right to vote. This would help legitimize their demands and protect the cause from co-optation and internal fractions, which are often present in actions of this magnitude. It would be of foremost importance to promote the collective and not individual figures. Linking a cause to (a) leader(s) is dangerous at so many levels: first, because individuals are easier subjects to political attacks, and second, because once the collective efforts are attached to a singular name, their legacy and longevity relies on it. In addition, only protesting without offering an alternative to the contested policies is pointless. Every social movement worth its salt at some point must turn and evolve into a politic alternative, crossing the border from unorganized political action to organized political action that provides structured demands in the backdrop of a given praxis. Theory must draw on revolutionary practice, and revolutionary practice must not divorce itself from organized political action. “Students are the yeast of the bread that will feed the poor1”, the verses of the Chilean musician Violetta Parra are today more relevant than ever, reminding us that students are a peculiar social group that have often revolted only for their own interests, but always in solidarity with the oppressed classes and for bettering a future that belongs to them as much as to the mine worker, farmer, emigrant and the unemployed, and every other group living on the margins of society. 1Me gustan los estudiantes porque son la levadura del pan que saldrá del horn con toda su sabrosura, para la boca del pore que come con amargura.